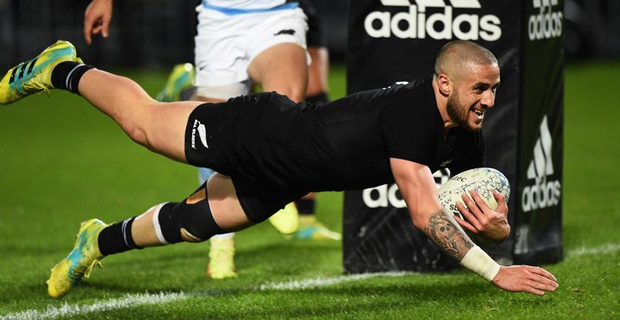 The All Blacks have repelled a rousing performance from Argentina, scoring six tries to win their Rugby Championship Test 46‑24 in Nelson last night. The resilient Pumas refused to lie down against the world champions, creating three tries of their own through the brilliance of five‑eighth Nicolas Sanchez. New Zealand were more clinical in the second half, crossing four times, including a second to halfback TJ Perenara to mark his first start in nearly a year. Five‑eighth Richie Mo'unga kicked 16 points in his maiden start but was untidy with his execution. His opposite Sanchez continued his brilliant form, scoring one try and setting up the other two in a 14‑point display. Mo'unga's second penalty put New Zealand 18‑7 up at halftime but the gap was reduced to four when the excellent Sanchez ghosted over. Coach, Steve Hansen says the way the team, especially Mo'unga, had rallied to deal with the reshuffles and then snuff out the Pumas' pressure had been most heartening for him looking ahead to next year's tournament in Japan. In another Rugby Championship match last night, the Wallabies snapped a four‑match losing streak with a gritty 23‑18 win over the Springboks. New Zealand are now leading the points table with 15 points, in second place is South Africa with 6 points, Argentina are in third place with 4 points while Australia is fourth also with 4 points.